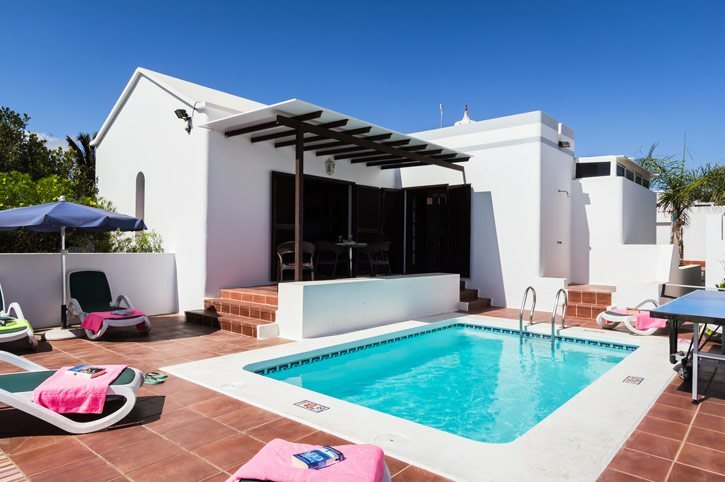 You can't get more central than Villa Tara Lanzarote! This lovely 3 bedroom property is in the heart of Matagorda with the shops, bars and restaurants just across the road. What's more the sandy beach of Matagorda is only 110 yards away. If this is not enough, Puerto del Carmen is 10 minutes' taxi ride away. The villa has a private swimming pool, delightful outside area and homely interiors. Air conditioning/heating in the bedrooms and lounge pool heating and WiFi are included. A fantastic central location in Matagorda with shops, bars, restaurants and the beach a stone's throw away. Perfect! The private swimming pool is surrounded by a terracotta tiled terrace with sunbeds for enjoying the Canarian sunshine . An elevated area, with two steps, has a table and chairs for dining alfresco with a brick BBQ to the side. There are also games tables for everyone to enjoy. There is a private parking area which is shared with our Villas Christine, Denise and Charlotte. A pathway leads to the entrance of the villa. The open plan lounge/dining area is tastefully decorated with bright artwork on the walls complementing the sofas and soft furnishings. There is a large pine dining table and chairs, a comfortable seating area and a flat screen TV. The light floods in through the patio doors which lead to the pool area. Just off the lounge is a separate and well-equipped kitchen with a small circular breakfast table by the patio doors which open on to the utility room. There is a double bedroom and 2 twin bedrooms sharing the facilities of a separate bathroom and a shower room. All bedrooms have ample space and are tastefully decorated. Villa Denise is located in the heart of Matagorda with the shops, bars and restaurants across the road and the beach at the end of the street. This is the ideal villa if you don't want to drive on your holiday and have all the resort amenities on your doorstep. What's more the lively resort of Puerto del Carmen is around 10 minutes' drive away. Our Villa Denise is next door and Villas Christine and Charlotte are on the same street. Across the road from Villa Tara Lanzarote is a commercial centre with gift shops and a handy supermarket to pick up those essentials for a day at the beach or villa. The commercial centre across the road is on the main promenade where you will find restaurants with choices for every palate including tapas, typical Canarian and international cooking. This main avenue leads to the lively resort of Puerto del Carmen. Villa Tara Lanzarote is only 110 yards from the beach. It makes an ideal choice for families who like to enjoy the sea, plus sunbeds and umbrellas are available for hire. Alternatively, around 10 minutes' drive away is Playa Grande Beach in Puerto del Carmen. The Rancho Texas Theme Park in nearby Puerto del Carmen has a variety of animals, birds, play areas and shows. There is also live music in the evenings and a BBQ. The Aqua Park in Costa Teguise is another fun day out with its exciting water rides. The Timanfaya National Park is probably the most famous place in Lanzarote. Here you will see demonstrations of the tremendous heat that still lies below the surface. You can also visit impressive house of Cesar Manrique which has been created by this amazing artist and is made of a series of volcanic bubbles which never fails to blow visitors away. There's a established golf course is in Costa Teguise and the newer course is just outside Puerto del Carmen, both have 18-holes. The Matagorda promenade goes in one direction passing the airport and then continues into the capital of Lanzarote - Arrecife. Going in the opposite direction you'll find the main holiday resort of Puerto del Carmen with the main Strip full of bars, discos, tavernas and restaurants. Villa Tara Lanzarote is not available to book for season as it is sold out. Take a look here at the Lanzarote villas that are currently on sale. The most popular resort on the island Puerto del Carmen boasts a fine sandy beach stretching 4 km along the pretty coastline with all the usual services. Having an attractive promenade you can browse at your leisure at the abundance of shops, duty free perfumes, clothes and handy crafts on sale. An ideal place to sit and watch the world go by in one of the many cafes and ice cream parlours. The second time we have visited this villa, excellent in every way. Looking forward to our return next year. Lovely villa in a great location.